Classical music has traditionally been a highbrow endeavour. Entrée attempts to change that, by making both the music and price accessible to a younger audience. 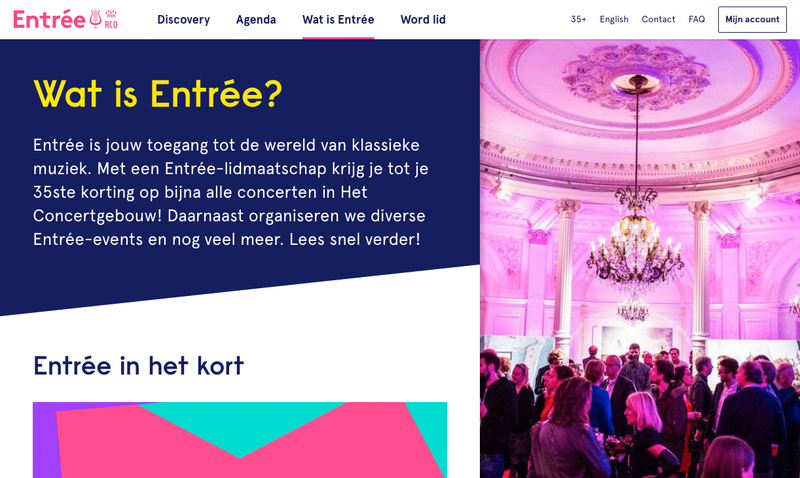 Entrée is the youth wing of the Royal Concertgebouw and Royal Concertgebouw Orchestra. 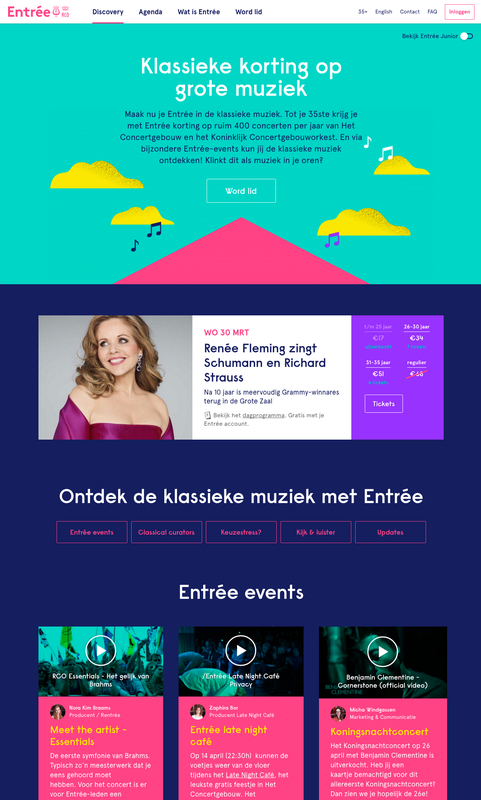 Both organisations are highly acclaimed, the Concertgebouw for its near perfect acoustics, and the Orchestra for being one of the best in the world. This of course brings a certain prestige with it, which can be a threshold and make classical music seem ‘difficult’. As long as you’re under 35 years of age, Entrée is for you. No matter if you’ve never been to a classical music performance in your life, or studying at a conservatory. Building on the vibrant identity made by Vruchtvlees, we set out to convince people that this music is worth their time and money. Finding a concert that suits your taste can be hard, especially if you don’t know any of the pieces, composers, conductors, and performers. To aid you in your search we introduced a small ‘translation’ for each concert, in the form of a subtitle. This tells you in plain language why you might be interested in that particular concert. The name dropping and formal tone of voice take a backseat throughout, as curators from popular culture tell you about their favorite concerts. 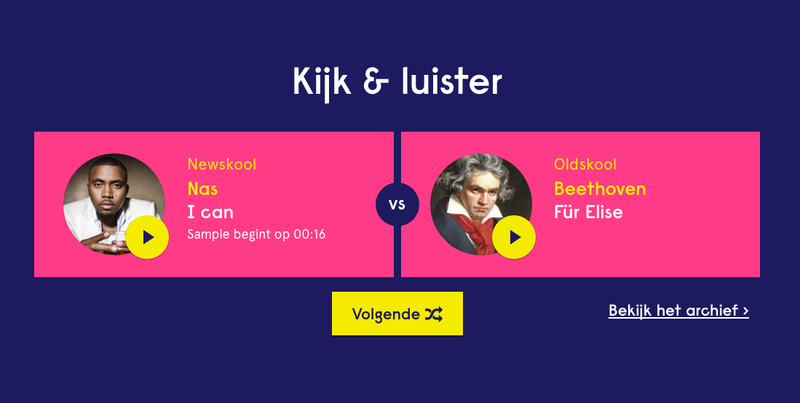 Find out that Nas sampled Beethoven through Oldskool / Newskool, our mini Who Sampled for classical music. Or let the concert advisor help you find a good concert for that date you got coming up. But a large part of Entrée’s 7.500 members knows exactly where to go. They’re classical music students, and come to the Concertgebouw to see the absolute best perform. We make it easy for them to search and filter the agenda to quickly find the concerts they want to see. If you’re a student, a lot of classical concerts are prohibitory expensive, even at the heavily reduced Entrée price. But since a vacant seat is everybody’s loss, members can subscribe to a so called ‘sprint alert’. If there are any tickets left on the day of the concert, we notify them through sms and they are able to buy a ticket at the lowest possible price. 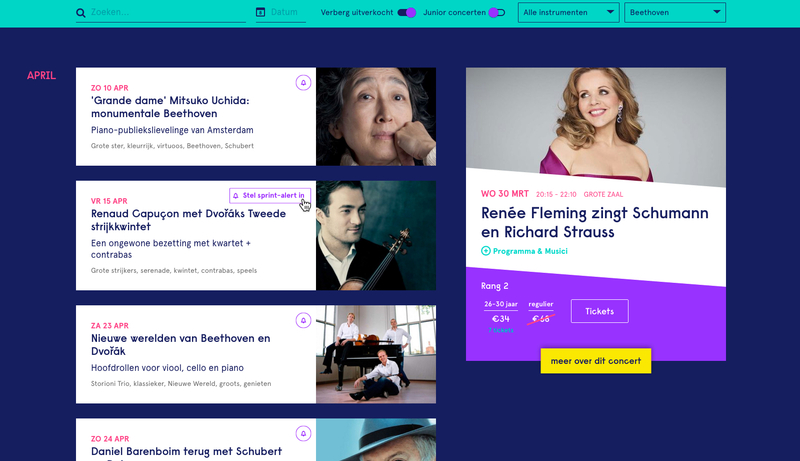 We link our platform to the MessageBird API, as well as the Concertgebouw member administration to handle sending the notifications. We hope to speak to an audience that has naturally shied away from classical music. All the names and lingo are still there for those that want it, but it’s no longer in the way of those who don’t. We regularly analyse user behavior to adjust points of friction, making sure everything is as easy as possible. If you classical music is not for you that’s totally fine. But if we can help you discover it by pointing in the right direction, I think that’s great.